...to 'Delta 64' the web-site where you will find a photograph of EVERY LOCAL AUTHORITY FIRE STATION in the 5 brigade areas of North West of England, plus a large number of appliance photographs, some incident shots, archive material plus a number of ancilliary vehicles. I am a retired priest in the Church of England. 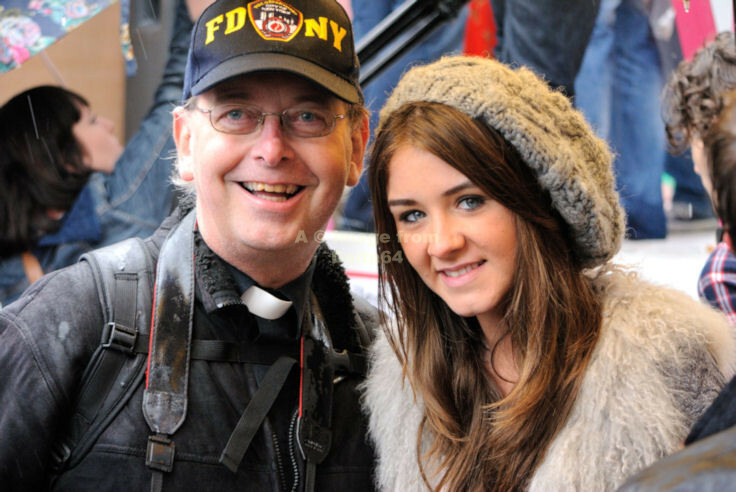 [Here I am with the beautiful Corrie Star ~ Brooke Vincent (Sophie Webster)] I was for a time a Fire Brigade Chaplain with Cornwall County Fire Brigade - callsign 'Golf-Sierra'. I am an ardent supporter of the Firefighters Charity, having been vice-chairman in Cornwall. My interest in the Fire Brigade began way back in the late 1950's when for a birthday treat I was taken along to our local fire station - the then Lancashire County Station - Delta 64. My interest was further kindled by Station Officer Bert Paine who moved to Newton-le-Willows on March 20th 1967 and served there until he retired 30th April 1974. He continued to live there until his death in early 2007. This site is dedicated to Bert and to all those fire-fighters based at D64 who encouraged me over the years. I would welcome any amendments to allocations or status details or any other constructive comments on the email address above. Thank you. The photographs included in this website are subject to copyright, images may not be copied, printed or otherwise disseminated without express written permission of the author. Under all circumstances, copyright remains with the original photographer or author. Remember that copyright is protected under international law. I DO NOT intentionally use other people's pictures myself without permission and due acknowledgment. However, I do realise, that occasionally it can happen that a picture is given to me in good faith which then turns out to be from someone else. In this case, a polite email should be forwarded so that I can either put the correct acknowledgement to the picture OR at the owner's request I will remove it from the site. Now just follow the links below.